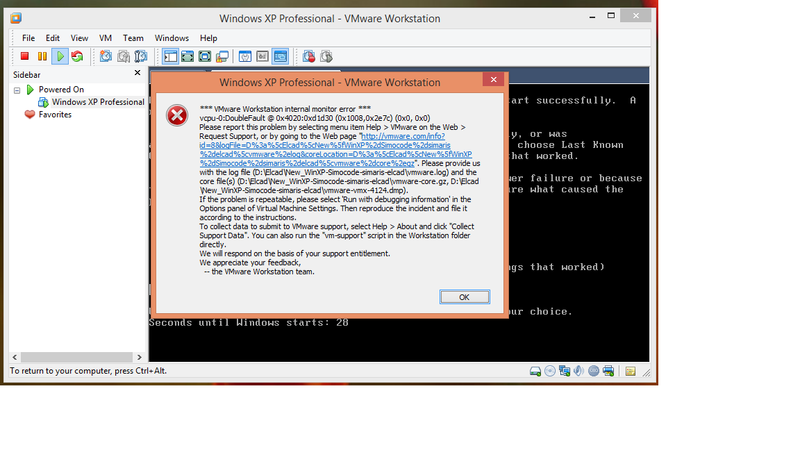 Kenapa di vmware workstation ane install windows xp error monitor yaa? ane jalanin vmware workstationnya di windows 8.1.. Please report this problem by selecting menu item Help > VMware on the Web > Request Support, or by going to the Web page "http://vmware.com/info?id=8&logFile=D%3a%5cElcad%5cNew%5fWinXP%2dSimocode%2dsimaris%2delcad%5cvmware%2elog&coreLocation=D%3a%5cElcad%5cNew%5fWinXP%2dSimocode%2dsimaris%2delcad%5cvmware%2dcore%2egz". Please provide us with the log file (D:\Elcad\New_WinXP-Simocode-simaris-elcad\vmware.log) and the core file(s) (D:\Elcad\New_WinXP-Simocode-simaris-elcad\vmware-core.gz, D:\Elcad\New_WinXP-Simocode-simaris-elcad\vmware-vmx-4124.dmp).